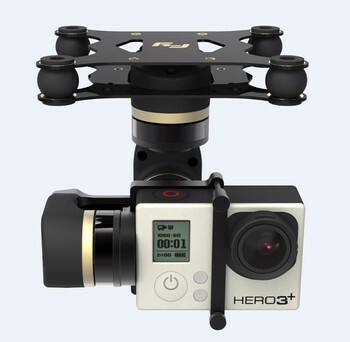 suitable for GoPro4,GoPro3+,GoPro3 or cameras with similar size. Can be easily mounted in fixed wing, multirotor, helicopter for aerial photography, and can work independently only need power supply. 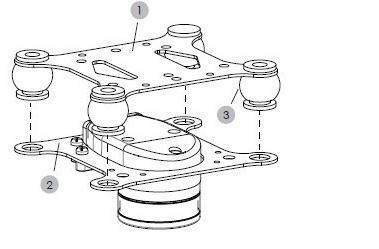 You can assemble the gimbal properly according to the drawing, and then install the video camera on it. There is no need to set up and adjust the parameter. 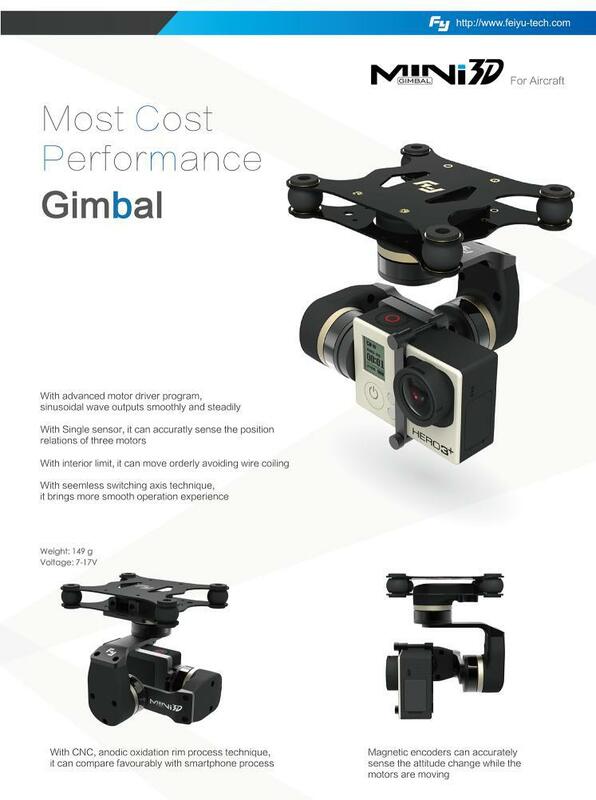 For the first use, power on the Gimbal, and then keep it static for a while, after its reset, the gimbal will be in a level position automatically. Then you can use it normally. Heading Follow Mode Camera Pitch and Roll angles remain constant, heading follows the nose position,pitch can be control by RC . Heading And Pitch Follow Mode Heading Camera Roll angle remains constant. Heading follow the nose position and Pitch follow the elevation of the aircreft. Heading Lock Mode Heading, Pitch and Roll are all locked to point at one position. Heading and pitch can be control by RC . 1. Install the damping ball to the adapter (up), then install the adapter (up) to the aircraft. Please according to the needing to use the "V" hanger. 2. 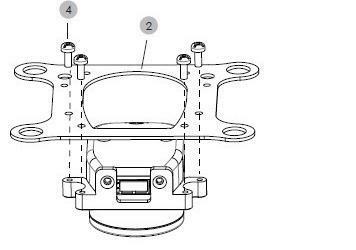 Please install the adapter (down) to the heading motor, refer to the following diagram. 3. 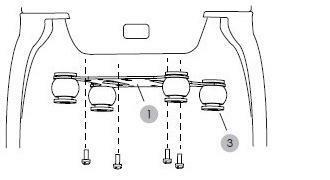 Install the part which assemble in step Ⅱ to the damping ball. 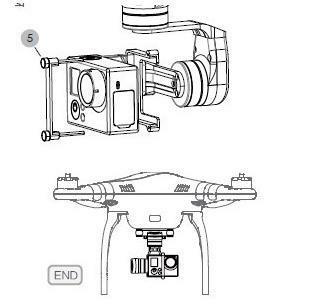 1.GoPro camera must be installed before supplying power to the Gimbal. Failure to do so will result in damage to the gimbal motors. 2. Be sure to connect the computer with the USB Connector. 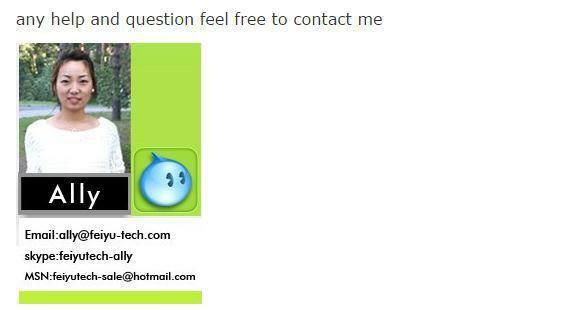 If any comments or suggestions please do not hesitate to e-mail me directly,Please visit the official website of Feiyu Tech to get related information : www.feiyu-tech.com Feiyu Tech reserves the right to amend this manual and the terms and conditions of use the gimbal at any time.